Hello all! Sorry we’ve been quiet for the last couple of months! We’ve been studiously working on Auro 2.0, as well as the Steam Early Access version, both of which should be ready in about two weeks or so. We plan to launch them together, in a big Auro 2.0 launch initiative. I wanted to run you guys through some of the huge changes that people will be seeing for 2.0. Of course, if you visit the Dinofarm Forums, you can see a lot of the changes in more specificity, but also the constant deliberation process that’s taking place and helping us determine what these changes will be. So this is by no means a complete list, and also there’s still time for some of this to change before the release, but here’s some of the big stuff we’re doing right now. It’s still just not that clear to new players what the goal even is. We’re solving this in a bunch of different ways, but one issue is the lack of clarity in the “Brashness Bar” concept. We went with that concept because we thought the quirkyness sort of made up for the weirdness, but what do you know – it didn’t! People don’t really get the Brashness Bar concept and I really can’t blame them for that. We could use a bit more of a sense of “progression”. I don’t think you need a lot; most online ladders just give you a new “shield” and maybe a few other tiny things. But right now we give the player too little to signify that he has advanced in rank. Argo being a jerk to the player is funny, but probably a net negative on new players who already find the game frustrating to learn. To solve these issues, we’re changing how stuff works. Instead of the more story-like “fending off the castle from the villain” metaphor, we’re going for more of a sport-like metaphor, which we think supports what Auro inherently is at its core: a single-player competitive game. Instead of constantly fighting against Argo, you’ll face a number of different opponents. We’ve got three new characters we’ve been developing, who will express themselves with portraits and text – one for each difficulty rating (Argo is still the opponent for the Master ranks). We think people will like these characters (who aren’t nearly as much of a jerk as Argo), and we’ll introduce them in an upcoming post. Instead of a “Brashness Bar”, you simply have “the opponent’s score” that you have to beat. Simple to understand, and familiar – quite like the approach in games like golf, bowling, or darts. This big “tournament” that’s taking place is called the Royal Bumping League. As you rank up, you’re not long facing new opponents and seeing new portraits, but the colors of the Play Hub XP bar change from bronze, to silver, to gold, as well as other screen elements, to help remind you of where you are. To be clear: this doesn’t change anything about the core functionality of the Play Mode system, of which we’re really proud and we think works really well. It’s only changing some window-dressing, but in a pretty important way. Another issue we’ve struggled with since the beginning is players feeling like “getting far” is the objective. Since there are teleporters, and a “last level” especially, it feels natural to assume that the objective has something to do with reaching a certain level (and not having to do with getting points). From time to time, players tell us that they’re just playing, and all of the sudden, they win and the match ends. This means that they are clearly thinking that they’re doing something other than trying to get points, so we want to fix that. Over the last 3-4 months, we’ve gone through a number of different map designs and other solutions to this problem. What we’ve come up with is this: a match takes place on a single map, roughly 2-3x the length of a normal Auro level. At the end of the level is just an unceremonious line of pillars, where the exits used to be. We think this will pretty quickly solve the problem of players thinking they need to “get far”. Right now we’re just finishing up some details on how to spawn monsters optimally – we may need the game to keep spawning them throughout the match so that the player never “runs out”, for example. One great thing about this is that games do something we’ve always wanted them to: they are immediately at pretty much max-interestingness. The first couple of stages in Auro 1.31 were noticably less interesting than the last two, I’d say. So we’ve further compressed the game into a slightly shorter and more intense match. We’ll have more details on this later, of course. Firebomb – Now affects an adjacent tile. This fixes the overlap that it used to have with Rotisserie (advanced players will notice that the two abilities, currently, have a lot of overlapping utility). 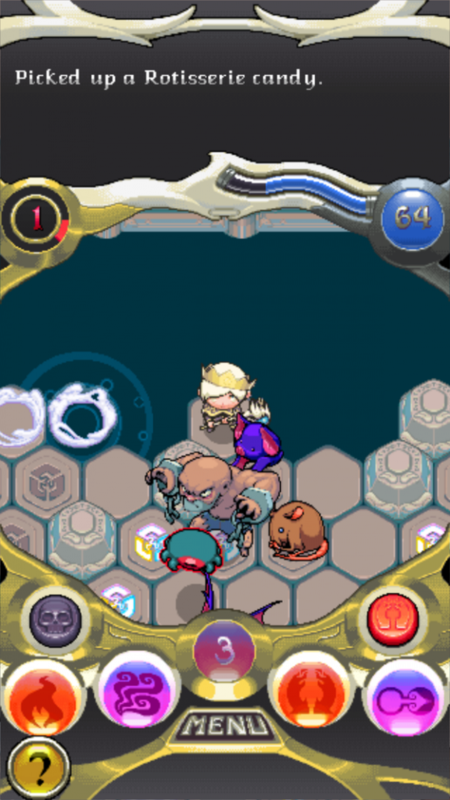 It also gives Auro more interesting movement options and synergizes with way more stuff. Snowball – Now “arcs” two tiles to its destination, so you don’t need a clear shot (but you also can’t hit someone adjacent to you). Also, we brought back the “pushback” quality that Snowball used to have. Blast – Now has a 2-tile range. In general, 3 tile range is problematic. Dash – removed the “swap with adjacent” functionality. However, you now dash up to 2 tiles in a direction without needing something to dash to. This actually opens up a ton of possibilities for gameplay, synergizing with far more spells than it used to. It’s also way easier to explain to players. With the new Dash, the player can actually Dash left here, hit that Vortex, and bounce to safety! Monsters: We already talked about Hard Monsters in Auro 2.0. Most of that is remaining true, although we’ve since had to nix the Vargas changes for something a bit less wonky (currently, he spawns scoreless Lava Bats, who cool into a new tile when killed). Finally, some notes about Steam Early Access: We should let people know ahead of time that the first versions that will make it onto Steam will be “direct ports”, pretty much. That is to say, they will look and play almost exactly like the mobile versions (we’ll probably add some basic hotkey support and a few other little things like that). However, we’ll start from there on setting up our widescreen HUD and other PC-version features for the eventual release on Steam. Thanks for reading, and let us know what you think of these changes. As always, we’re looking for new beta testers for new versions, so come sign up at the forums! I’m super excited for this update. Keep up the amazing work! I just got a smartphone, finally, and have been following you guys on this project for a couple of years now.. So I planned to buy Auro now, but noticed there is a 2.0 coming up.